MARRICKVILLE: A great crowd of people with “fur-kids” came to join a day of fun at the Street Paws festival in the Addison Road Community Centre. Organised by Sharon Garrard for Chic Petite Events, the festival was held in conjunction with the street food markets on Saturday February 17. Considering the inner west boasts one of the largest populations of dog owners in Sydney, Addison Road was the perfect place to launch this new festival. Ms Garrard, who lives in Dulwich Hill, rescued three street dogs – Bob, Shorty and Shy – from Fiji six years ago, but says this is the first time she has combined her love of dogs with her profession as an events organiser. The day was amazing with approximately 2,000 people in attendance, and dogs of all shapes and sizes. Angie and Yvie from Gogglebox attended, along with Australia’s largest dog. 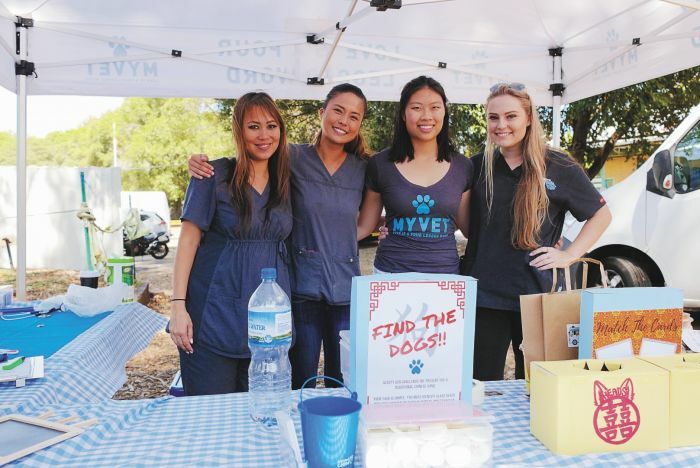 Thirty stalls, with unique products and expert tips from vets and animal behaviourists, including free medical checks from event sponsors Marrickville Vet and Vets to Go, added to the attractions. A “Posing Pooches Photo Booth” engaged people as well as “Find your next new fur-friend” at Maggie’s Pet Rescue. The Inner West Council provided free dog tags which people had engraved on the day. There were also plenty of fun competitions with prizes for categories including the “Best Old Timer” for dogs over 10 years, the “Ultimate Tail Wagger”, “Sounds and Hounds” for dogs that make unique sounds, “Parade Your Pooch” for fancy breeds, and “Strut Your Mutt” for the quirky cross breeds. Whether you were there with your dog, or just to watch it all, it was a great day – so relaxing and enjoyable. The Street Paws festival was sponsored and supported by the Addison Road Community Centre, Marrickville. The next event will be held in the middle of May in Sydney’s west. For more information, search Street Paws Festival Marrickville on Facebook. Its fabulous that the Addison Road Community Centre which is our amazing neighborhood Centre organizes such incredible events for the entire community. Wow, some neighbourhood centres are limited to services, our Marrickville implements something for everyone so all the community can share.